Each person on the customer service team has it in his or her power to create a more positive work environment. And that’s good for everyone — the benefits include improved teamwork and cooperation; a happier, healthier staff; and more satisfied, loyal customers. This practical training package provides advice and guidance from a range of industry experts on how to look within to better understand one’s own emotions, motivations, and behaviors and how they contribute to a respectful, harmonious work environment. Best of all, the same tools and skills that reps use when working with customers can be just as effective when interacting with coworkers. This hands-on guide includes a worksheet to help your reps identify the things that cause them the most stress. Strategies for accepting the stressors they can’t change and for creating a personal action plan to change those things that they can. 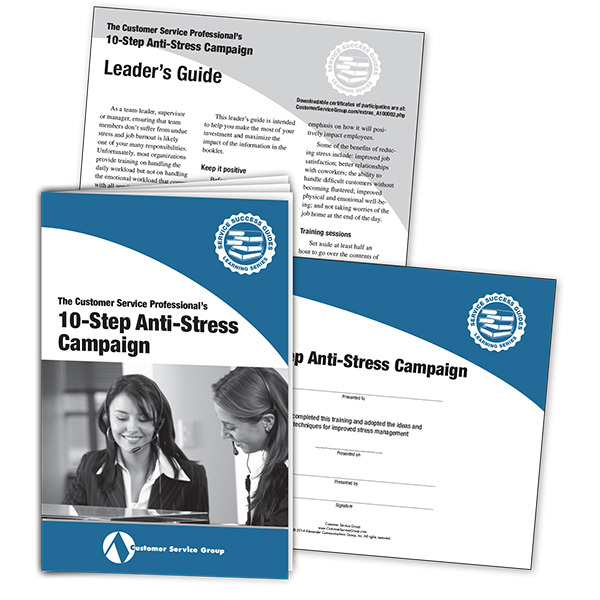 The guide also includes time management strategies, stress reduction exercises, techniques for creating “worry time,” and more. Now that you’ve listed your main stressors and identified those that can be changed and those that can’t, it’s time to write a plan of action for dealing with those top stressors that can be changed. First, take one last, hard look at the stressors you identified as unchangeable. Are they really unchangeable or is there something you can do to at least make them more manageable? If you can influence these stressors, mark them as changeable as well. Now, write each of the changeable stressors at the top of a sheet of blank paper. Next, think of as many remedies as you can for each entry, and write them down. Be creative — don’t restrict yourself to the solutions you’ve always come up with. Say, for example, you listed lack of skill in a certain area, such as cross-selling, as a stressor, and you listed a personality conflict with a coworker as another prime stressor. If the coworker is good at cross-selling, perhaps you could lessen both stressors by asking him or her to coach you in that area. Get the idea? If one of your problems is being barraged by phone calls at certain times of the day, you might level the workload by suggesting the best times for your customers to call, or by giving customers all the information that they need on the first call so they don’t have to call you back. Once you’ve gone through your list and come up with some remedies, set it aside for awhile, and come back to it in a day or so. See if you can come up with some additional solutions to add to the list. Once you’ve gone through your list and come up with creative new solutions for each of your changeable stressors, set it aside for awhile. Come back to it in a day or two to see if you can come up with additional ideas to add to the list. Then pick the stressors you want to work on. Don’t add to your stress by trying to do too much at one time. Write down a realistic target date for each action step you’re going to take. Then set up a way to remain accountable to yourself, such as making notes in your day planner or reporting your successes to a friend or coworker. Every organization is unique and has its own set of challenges that staff routinely bump up against. Often these add to the stress and anxiety of service staff. As a group, work to identify and solve some of these challenges. 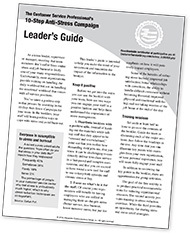 In the booklet, reader’s are asked to list three things that routinely cause them stress at work. It might be anything from rush orders at the end of the shift, to coworkers returning late from breaks, to reports from another department that are incomplete. Ask each team member to share their list with the group. 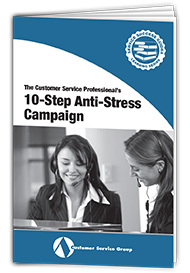 Next, analyze and categorize the types of stress-producers your staff is encountering. As we say in the guide, there will be some stressors that cannot be changed, but there will be some that can be changed. Select a small group of stressors and assemble a team to provide recommendations for improvement. In addition to removing a stressor, this activity will help build teamwork, identify potential leaders, and provide a rewarding break from regular duties. 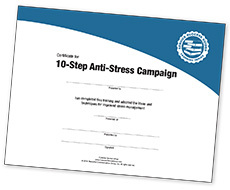 10-Step Anti-Stress Campaign is guaranteed. We want you and your reps to use this valuable resource and put its ideas to work in your department. Then, if you are not 100% satisfied, you may return your materials within 30 days for a full refund.